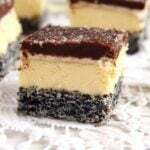 A poppy seed cake base covered with a luscious vanilla buttercream layer, coffee dipped biscuits and topped with a decadent dark chocolate glaze. What would you want more when it comes to cakes? 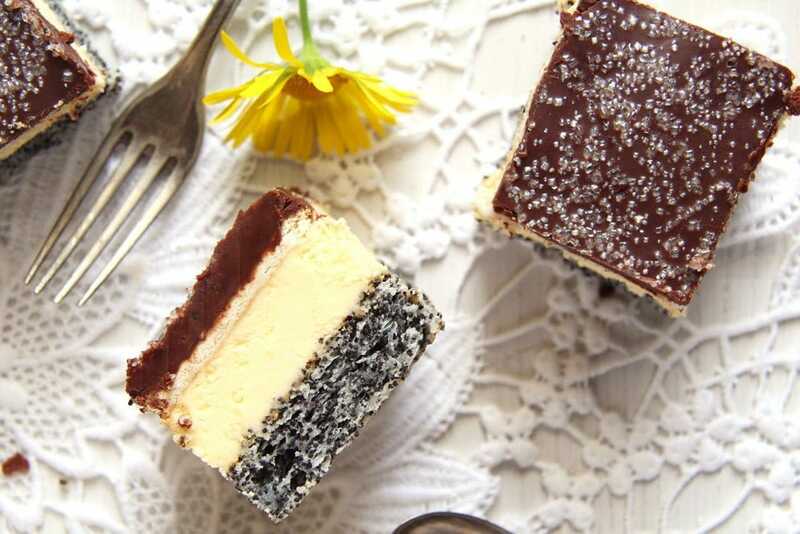 This Vanilla Poppy Seed Cake with Chocolate Glaze or Romanian Tosca Cake has it all! 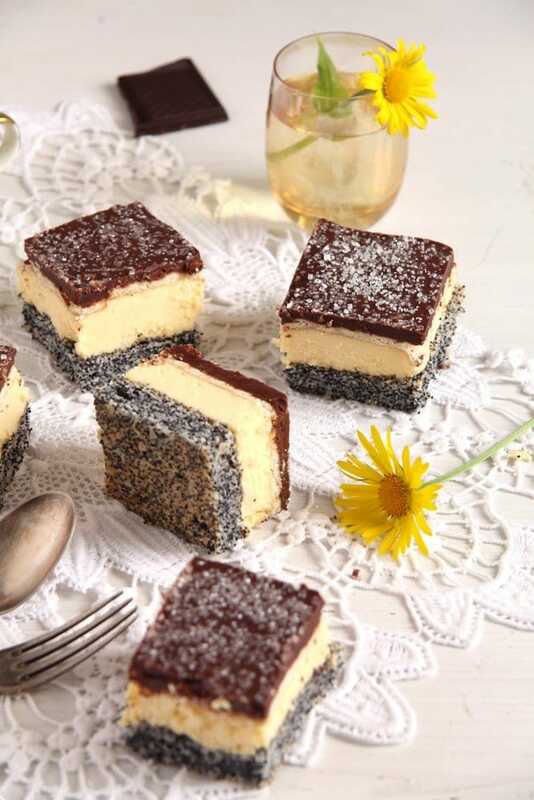 An aromatic base made with egg whites and lots of crunchy poppy seeds, vanilla buttercream, a bit of coffee and a thick layer of chocolate on top of everything. It is sooooo good! I don’t know about you, but when it comes to baking I do like have a little bit of something more to do sometimes. I do love the simplest, easiest cake recipes like this Easy Apricot Cake or this Biscuit Apple Cake as well, they are always the first choice actually and they come in very handy many times when the time is short and the ingredients I have in the house scarce, but from time to time I like taking the time to try a new cake recipe and make a more elaborate layer cake like this Vanilla Poppy Seed Cake with Chocolate Glaze or this Egyptian Hazelnut Cake or a fondant decorated cake. I do love scribbling down the recipe, taking all the necessary ingredients out of the pantry or the fridge, arranging them on the working surface, weighing the ingredients, mixing, heating, coating, kneading and so on, everything that comes along with baking and decorating a cake. I am not a particularly tidy person; except on cleaning days, you will always find thing lying around the house, in places where they shouldn’t actually be, garden work is annoying so I have lots of weeds and the flowers don’t survive long in my garden or in the flower pots, but when it comes to baking I become really pedantic. I’ve actually meant to post this cake in May during the Famous Romanian Cakes series, but when transferring the pictures from my camera to my computer, I must have clicked the wrong thing and I could not find the pictures anymore. I looked everywhere but nothing, so I thought I have deleted them by mistake. I wanted to make the cake again, because I had liked it so much and I wanted to post it, but then things came in between and I didn’t get to bake it anymore. And then recently while searching for something in an old folder which I rarely open, I found my pictures again. So happy!!! Preheat the oven to 180 degrees Celsius/ 360 degrees Fahrenheit. Line a baking dish of approximately 21x32 cm/ 9x13 inch with baking paper. Separate the eggs. Set the yolks aside for the buttercream. Beat the egg whites with a pinch of salt until stiff. Slowly add the sugar and continue beating until the egg whites are stiff and glossy. 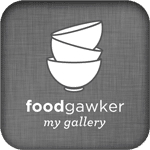 Mix together the flour and the baking powder in a small bowl. Fold them into the egg white-poppy mixture. Bake the cake base for about 30-35 or until a toothpick inserted in the middle comes out clean. Leave to cool completely. In the meantime make the vanilla buttercream. Place the egg yolks and the sugar in a saucepan and mix well. Add the milk and the vanilla pudding powder and whisk very well to prevent getting clumps. Heat the mixture gently while whisking all the time until the mixture begins to thicken. It will take about 10 minutes, but please whisk continuously or it will clump. Let the vanilla pudding reach room temperature. Take the butter out of the fridge and let it reach room temperature as well. Cut the soft butter into small cubes. 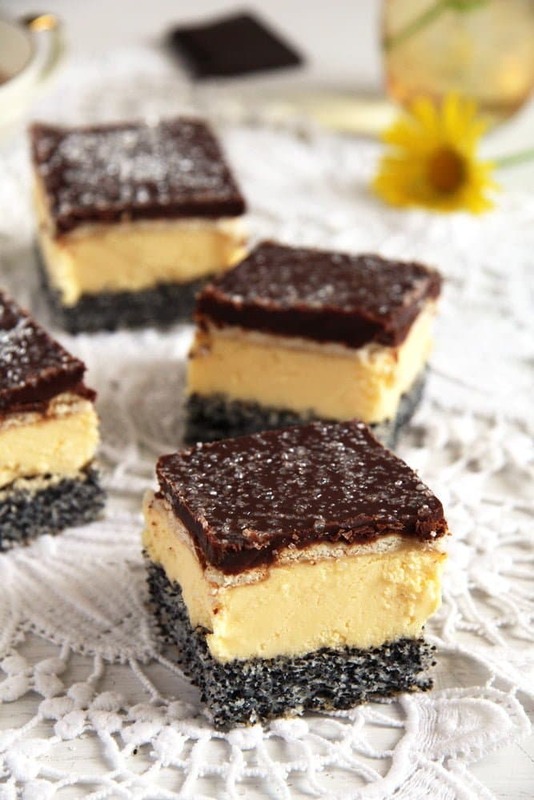 Gradually give the butter cubes to the vanilla pudding and mix well to incorporate. I prefer to do this in the kitchen machine. Spread the buttercream evenly over the cooled base. Make a cup of strong coffee. Dip the biscuits one by one into the coffee, but don't let them get soaked, they should be just barely wet. Arrange the biscuits on top of the vanilla buttercream. Chop the chocolate very finely. Give it to a small heat proof bowl. Add the chopped butter and the heavy cream. Melt the chocolate on bain-marie, stirring often until everything is melted and mixed. Let the chocolate glaze cool for a few minutes and pour it over the biscuits while still warm. Spread it evenly on the cake and place the cake in the fridge for at least half an hour until the glaze sets. I’ll have to make this cake really soon! I feel exactly the same way about baking, it’s always a pleasure, not a burden 🙂 And I always need a little mess to function properly haha. I just thought today that my house is never as clean as I’d like it to be, but usually I try not to pay so much attention to every dirty little spot and just do something I like instead. Have a great weekend, dear! My husband will love this cake because he is crazy for poppy! This cake is gorgeous, in addition to sounding delicious! You’re such a straight cutter too! what beautifully contrasting layers! each one is delicious, too, so this is pretty much the best cake ever! Oh gosh, all the cakes look wonderful. 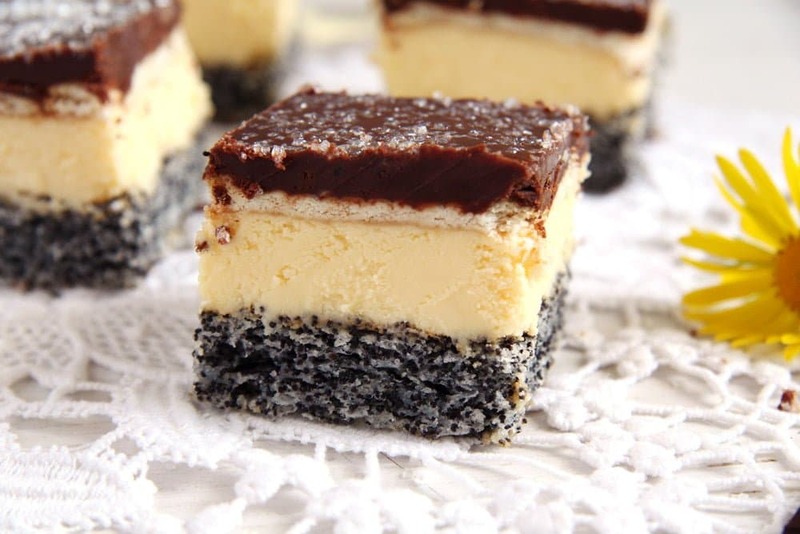 I love the layers…so special! 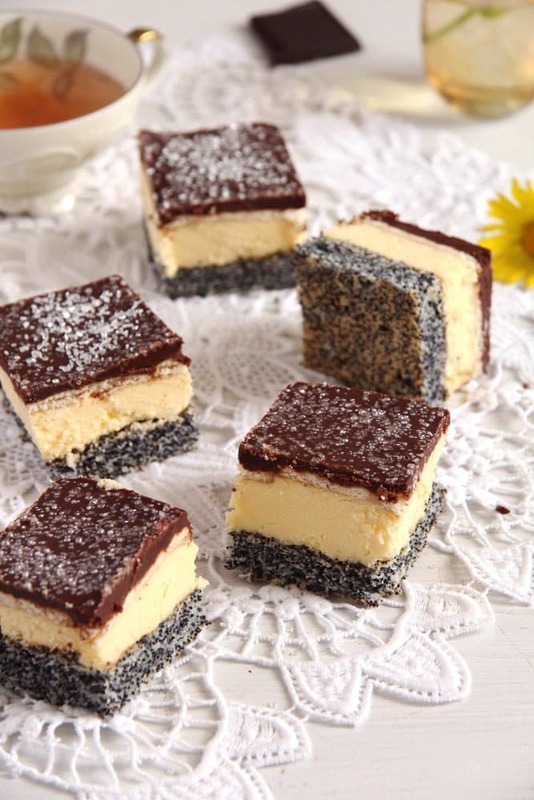 I love poppy seed cakes as long as they are moist and creamy and this one looks certainly the way I love them! And there is a chocolate layer too!! !